SCENARIO: we’ve all just watched Gonzaga take home their first title following a 66-65 win over Virginia in the final seconds! For Gonzaga, the championship win boosted their record to 38-2 and marked their 29th consecutive win, dating back to December. It was the culmination of an incredible Elite Eight on, as all eight #1 and #2 seeds survived to that point. It wasn’t a tournament of crazy upsets, but a great one for those looking to see the country’s best teams go head-to-head. We’ll start with the Zags, who deserved every bit of their #1 seed after running through all of West Coast Conference play undefeated. Incredibly, only one of their conference games was even within single digits, a 5-point win over St. Mary’s to end the season. Their two game losing skid from December turns out to be all the adversity they face in the regular season, and after winning the WCC tournament as well they enter March with a 32-2 record and ranked #4. They get the last #1 seed, and are set to play their tournament games in San Jose and Anaheim. 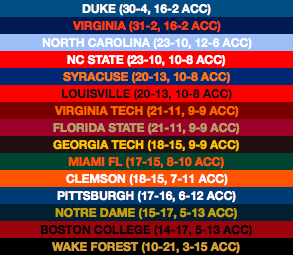 Next is the ACC, who saw, as is becoming custom in these sims, Duke and Virginia making big runs through conference play. Both of Virginia’s conference losses came at the hands of Duke, meaning that Duke entered the ACC tournament as the #1 seed by winning that tiebreaker. (Duke, in addition to their extant loss to Syracuse, surprisingly lost to Miami late in the season at home, leaving them both at 16-2.) Virginia got their revenge in the tournament final, leaving them as the choice for the #1 overall seed in the NCAA tournament. For their part, a 30-4 Duke team is an easy choice to be #2 overall. As #1 seeds, both Duke and Virginia make it through to the Final Four, but neither as smooth sailing. Virginia is able to hold Nevada to 35 points in their Sweet Sixteen matchup, but that’s the main accomplishment. UVA is happy to get out of the first round alive, as they actually did have a difficult time with Cal State Fullerton. The other Final Four team, besides Gonzaga, Virginia, and Duke, is Tennessee, the lone #2 seed to prevail in the four Elite Eight matchups between 1s and 2s. Late-season losses to Kentucky and Auburn meant that the Vols finished in a 3-way tie atop the SEC with Kentucky and LSU, all at 14-4. 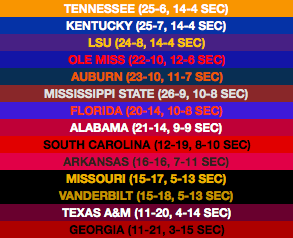 This year’s SEC tournament was a wild one, when in the quarterfinal round, seeds 5, 6, 7 and 8 all upset their higher-seeded counterparts. Turned out to be a major positive for the conference when all eight of those teams made it into the tournament. 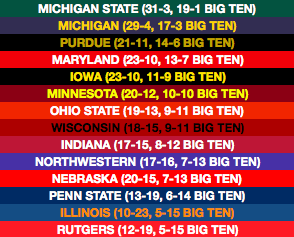 The other #1 seed belongs to the Michigan State Spartans, who IRL are in the midst of a 12-game win streak. Here, that streak is extended to 23 wins in a row before the rival Michigan Wolverines end that streak in the last game of the season. Michigan State’s bid to go 20-0 in Big Ten play is stopped just short. Revenge doesn’t get to come in the conference tournament, when 11th-place Nebraska racks up wins over Minnesota, Purdue and Michigan before falling in the final. Nebraska might have made the tournament regardless, but that cinched it. 19-13 Ohio State is the first team left out of the tournament, and as you’ll see later, they have someone to blame for it. 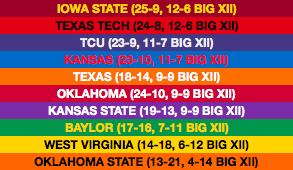 It’s a wild conference season in the Big XII, with the top seven teams finishing within three games of one another. Anyone could have won this conference, and that’s borne out when Oklahoma destroys top-seeded Iowa State in the conference tournament final. 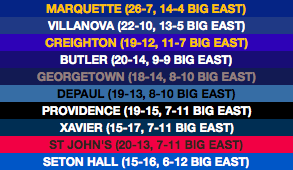 Even with what’s already happened for real, it’s a decent improvement this season for DePaul basketball, but what they accomplish in this sim’s Big East Tournament is something else. Three straight wins, over Creighton, Providence and Butler, give the Blue Demons their first NCAA tournament appearance since 2004. It’s a rare act of a power-conference team going through to win an extra bid for their league, and that final victory over Butler gives DePaul the spot in the tourney that would have gone to Ohio State. 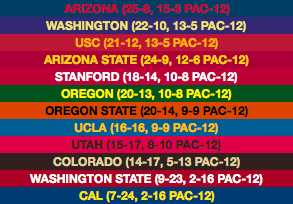 The Pac-12 misses out on an opportunity to have 3 teams in the NCAA tournament on a couple of fronts. First, Washington, probably on the inside looking out at the time, loses their conference quarterfinal to 7-seeded Oregon State; then, after the Beavers upset USC to reach the final, they fall short of winning the tournament themselves. Just the two Arizona schools find their way into the tournament, although both are more highly-seeded than they would be if the season ended today. 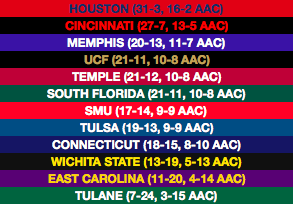 Houston’s excellent season to this point continues in this sim, only losing one more game in the regular season (to UCF). A loss in the conference tournament final vs. Cincinnati means they enter at 31-3, good enough to be chosen as a #2 seed. Others: San Francisco picks up one of the four final at-large berths out of the WCC, with a 25-7 overall record. Despite going 0-3 against Gonzaga, they’re just good enough. Nevada and Fresno State were both good enough to make the tournament on their own merit, so it’s lucky for some bubble teams that they met in the MW tournament final, with Fresno State winning a close one. That’s it, as far as at-large selections go, with the rest of the potential at-large teams winning their conference’s automatic bid (Buffalo, VCU, Wofford). The stories of the early rounds of the tournament, without a doubt, are a pair of 14-seeds. The biggest upset from a probability standpoint in the tournament is Sun Belt winners Texas State taking down Kansas with just a 9.3% chance of winning, per BracketBot’s estimation. But, the second and third-biggest upsets of this tournament belong to the same team, the Lopes! Grand Canyon took down both the 3 and 6 seeds in the South Region, Mississippi State and Maryland respectively, to reach the Sweet Sixteen in their first year of tournament eligibility. We also have two 11 seeds reaching the final 16, though past that point it’s all 1s and 2s. Thanks for reading this Season Sim! I’ll have another one for you over the weekend, and there’ll be another bracketology update on Friday!